Ear buds are great, but nothing matches the pure sound quality that over ear headphones can provide. These days, people are listening to more music than ever, and much of the time they’re listening to that music on the go. That’s why headphones are so important. If you’re like me, you have a crazy lifestyle that requires you to always be on the go. However, there’s no reason why you should have to sacrifice your good-sounding music while you’re on the road! That’s why this list of over ear headphones is so important. In this guide, we’ll show you the five best over ear headphones under $100. You can find some absolutely great, quality headphones without breaking the bank, and the products on this list are a testament to that. The way that over ear headphones surround your entire ear makes them a superior sounding product. In fact, the larger frame of an over ear headphone allows it to have many redeeming qualities relative to earbuds or on ear headphones. First, many of today’s headphone models are wireless bluetooth, giving you freedom from cumbersome cords and wires. However, along with that innovation comes a new problem: battery life. Often, wireless earbuds and headphones are saddled with poor battery life that limits their usefulness. Because over ear headphones are bigger, they also offer bigger batteries that will keep you jamming to your music for hours and hours. Instead of stopping every few hours to charge, you can blast right on through your day listening to high quality music. The market of over ear headphones is pretty crowded, to say the least. Fortunately, that means that there is a ton of quality products out there under $100. Unfortunately, it may seem pretty intimidating when you’re choosing which product to buy. That’s why we wrote this guide, to take the stress out of shopping for over ear headphones. You can be sure that these products will save you money, but never compromise in terms of quality. Every pair of headphones on this list would be a fantastic purchase. Sometimes, it just comes down to minute details, and this case was exactly that. But we did pick an overall winner. Overall, we chose the Philips SHP9500 as the best over ear headphones under a hundred bucks. 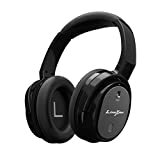 These incredibly affordable headphones are able to offer a full spectrum of sound with an extremely quality design that will certainly turn heads when you wear them. To decide exactly which headphones were the best, we had to sift through the many products that were released in the past year. These headphones are being judged on the basis of being used to listen to music. If you’re in the market for gaming headphones, check out our article on the best gaming headset under $100. Some of these headphones could conceivably be used for gaming, but we didn’t focus on that specifically. These criteria below, in descending order, were the most important when we were choosing our final winner. These aren’t the only things that are important–make sure to read descriptions of these products thoroughly before purchasing–but we thought they were the five most important. These criteria determined which of the headphones we considered would take home the top prize. It’s important to have high quality headphones, because music is often an important part of people’s lives. We did all the hard work and found the best over ear headphones under 100 dollars, so that you can save money without sacrificing quality. Naturally, the most important factor to consider for us when we were comparing these headphones was sound quality. A pair of headphones, after all, is only as good as the sound quality. There’s nothing worse than listening to your favorite music when the quality is just not there. Whether it’s poor bass, a “tinny” sound, or an incomplete sound spectrum, one of the things that plagues budget headphones the most is poor sound quality. That just won’t cut it for us. We made sure to look at the sound quality of each of these headphones first and foremost before looking at anything else. Even though these products are under $100, you won’t know it from listening to them. A pair of headphones with good sound quality is hard to come by, much less in a product that costs less than $100. Fortunately, we scoured the internet and found five pairs that had great sound quality, especially when you consider how cheap they are. Good sound quality to us means accurate signal transfer, high quality drivers, and a complete spectrum of sound. What this means is that the bass will be deep, the treble will be distinct, and the overall sound of your music will be full and pure. You can be sure that these headphones are the top of the line in terms of sound quality. After all, that’s the most important feature of a pair of headphones! A feature that we think is often overlooked when it comes to headphones is comfort. You’ll be spending a lot of time with these things wrapped around your head–doesn’t it make sense to care about how they feel? Many headphones in the “budget” category suffer from uncomfortable materials. Often times, the first place a company will compromise to cut costs is in the materials. We made sure to look at the way these headphones felt on your ears and head to ensure that extended prolonged usage wouldn’t become uncomfortable. Headphones are increasingly becoming status symbols. From celebrities to pro athletes to everyday people walking down the street, seeing a pair of headphones wrapped around someone’s neck or on their ears has become a common sight. That’s why we wanted our list to look at how these products look, too. Headphones are an honest-to-goodness accessory, and having a goofy looking piece of plastic around your head is enough to throw an entire outfit off. Often overlooked, we thought style should be an included criteria when selecting our favorite over ear headphones under $100. Yes, all of the headphones on this list are extremely affordable at under $100. But sometimes, you simply get more for your money. We awarded extra points to headphones that were priced as a budget product but delivered the features of a premium product. Nothing is worse than buying a budget item only to have it break, not work, or be insufficient for your needs. We believe that you can and should have the best of both worlds–these five headphones are both quality and budget friendly. There are some cool features that are included with headphones nowadays. From bluetooth capability, which will untether you from constricting cords and wires, to noise cancelling capability, which can save your plane ride from disaster–these headphones are truly advanced. We gave extra points to headphones that included premium miscellaneous features while remaining under $100. After a long process, when weighing the five features aforementioned, we decided to award the top prize to the Philips SHP9500 over ear headphones. First, we looked at the sound quality. Philips has a reputation for delivering outstanding sound technology in their products, and the SHP9500 is no exception. These headphones offer 50mm neodymium drivers that provide a full, rich spectrum of sound. The 50mm speakers will sound like much larger speakers once you get your hands (or ears) on them. Another area where this product excels is comfort. The SHP9500 has a comfortable dual-layered headband and breathable mesh earpieces that will stay cool and comfortable for hours of listening. In addition, the included 3m cord is long enough to give you ample movement freedom while in use, an important thing to consider. These Philips headphones are pretty stylish as well. The black cloth material with the metallic plastic finish provides a contrasting look that is very pleasing to the eye. The see-through grate siding on the speaker portion of the headset draws the eye in and caps off an incredible design. Perhaps the best part of these headphones is how much you get for the price. The Philips SHP9500 are bona fide superstar headphones, and we could see ourselves paying well over $200 for a model like these. That’s why our jaws dropped when we saw the price–these things will set you back just over sixty bucks. These headphones are truly great. They don’t come with a noise cancelling feature, so if you work in an office or fly a lot, you may want to look a models that do. But all in all, you’re not going to find a better pair of headphones in terms of value and usability. The Naztech i9BT headphones are an incredible value. They were a close second to the Philips headphones, and the features packed in this product will make it pretty obvious why it was so close. The sound quality isn’t as good as the Philips model, but its close. The 40mm drivers deliver and outstanding spectrum of sound, and bass boosting ensures rich, full sound. Where these headphones really excel is comfort and style. The distinctive white and brown coloring looks striking and attractive, and the pleather earpieces feel as great as they look. These headphones are built for hours and hours of use. At just under ninety bucks, these headphones are definitely budget friendly. They become an even better value when you consider all the extra features Naztech has packed in. Noise canceling, bluetooth, in-line microphone, and tangle-resistant cable all made their way into this product, and for that we’re thankful. Not a brand familiar to many people, AKG also releases very quality headphones. The K 240 MK II is no different. The 30mm XXL drivers produce accurate signal transfer and a great dynamic sound range. With a semi-open build, these headphones provide extremely deep bass and “airy highs,” perfect for studio headphones. They do look quite bulky, and the heavy material may get a little hot on your ears with extended use. But the pads are soft and plush and will feel great on your skin. At under 80 bucks, these headphones offer quality sound that is far above what it’s priced at. These AKG headphones are fantastic for people who may be more into producing music or listening at home, as they are tailored towards that group. They might be a bit bulky to walk around in. Another pair of headphones from a little-known company, the Litexim QW-07 headphones are an outstanding choice for the music lover on a budget. Their “Apt-x” sound technology delivers perfectly respectable sound for a headset priced so low, and you won’t be able to tell you’re listening to a budget device. The QW-07 may not be much to look at, and we doubt you’ll see it on a runway anytime soon. But what it lacks for in style, it makes up for in comfort. These things are extremely comfortable and made out of pretty high quality material, so if you wear headphones for a long time, they definitely deserve a look. Priced at under 80 dollars, these headphones offer fantastic value by including some great features. The best of them is the noise canceling feature, which it displays prominently on it’s earpiece. Litexim claims that 85% of noise is filtered out when the feature is enabled–perfect for travel, work, or a noisy commute. The final headphones on our list is the Skullcandy Crusher. These budget friendly over ear headphones are pretty darn good. Skullcandy markets their “bass-boosting” technology, claiming to match even the best headphones out there in bass quality. The best feature of these headphones is probably their style. Especially for our younger readers, the Skullcandy Crushers look really cool. With a built in in-line amplifier, Skullcandy was able to slim down the profile of their headphones while increasing the sound quality, creating an overall better product. 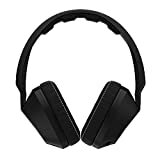 One of the cheapest pairs on this list, you can’t go wrong with the Skullcandy Crushers for reliable headphones on a budget. When it comes to music, we know that the way you listen to it is vitally important. Ideally, you don’t even notice the headphones–they simply serve as a connection to your music that fades into the background. We think this list of headphones contains five fantastic products, but the overall crown definitely went to the Philips SHP9500. 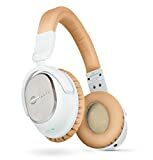 They have the best sound quality, comfortable material, and value for the price of any of the headphones on this list. We also think they’re pretty darn stylish, as well. You can’t go wrong with any of the headphones on this list, though. We hope this guide has helped you in your decision, and revealed that you don’t have to sacrifice quality to find a budget friendly headphones option. We've looked into the Best Over Ear Headphones under $100 and ranked them from best to worst. Find out what makes a budget pair go from good to great.